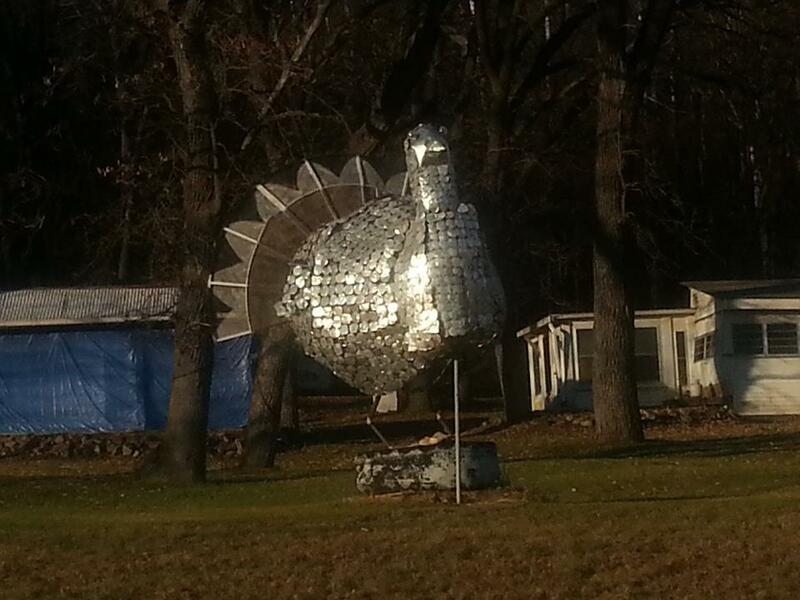 from this year's Turkey Palooza house. As many of you know, Thanksgiving is our family's favorite holiday and over the years it has morphed into a week long celebration/family reunion that we have dubbed Turkey Palooza. This year we had one of our best Turkey Palooza extravaganzas to date and that was the kick off to what I have dubbed a very fowl month. 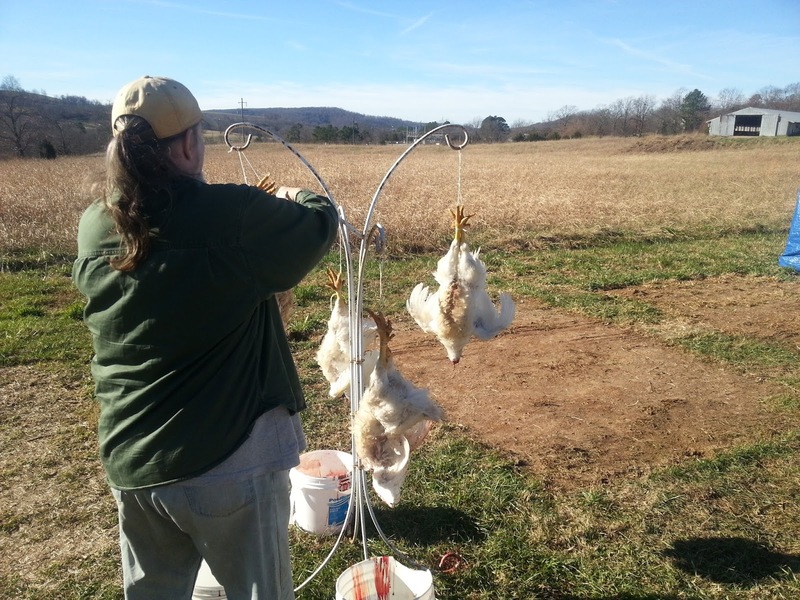 This summer we partnered with Carol and Ron, some friends in our self-reliance group, to raise meat chickens. 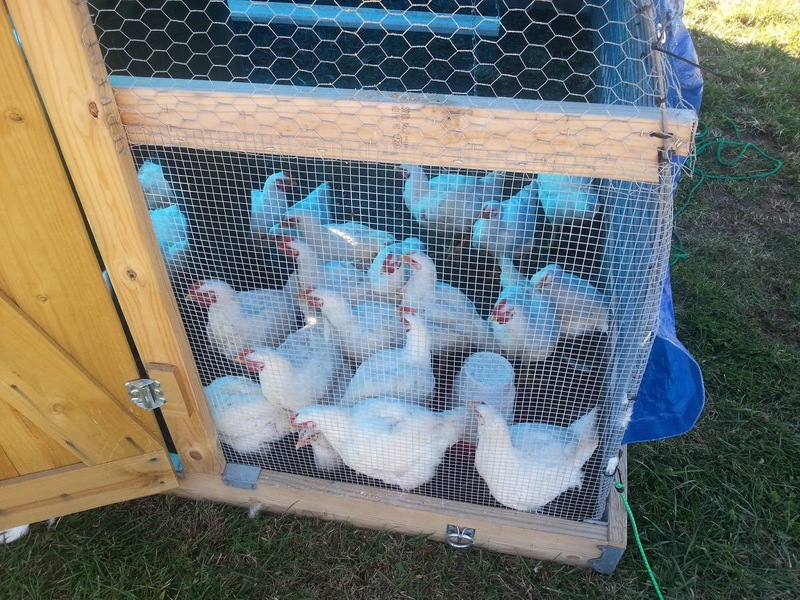 We built a chicken tractor together at their property, ordered in 40 chickens to raise from chicks and planned to butcher them at about 10 weeks, which happened to be when we were returning from Turkey Palooza. Upon our return, we scheduled The Day with our friends. We planned to kill and dress out all the birds in one fell swoop if we could. and think they are getting fed. If an off-gridder raises a bunch of meat chickens she's going to want a freezer to store them in before canning. 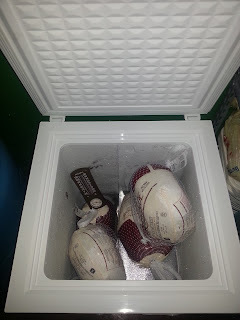 If you give her a freezer, she is going to want 6 frozen turkeys to quickly cool down the freezer when she brings it home. If you give her the six turkeys she is going to make a lot of bone broth to can. If she makes a lot of bone broth she is going to want a lot more canning jars. If you give her canning jars, she is also going to cook and can all her frozen chickens.... you get the idea - it has felt like an unending process. And yes, we bought a small freezer that we can run off our solar system (in sunny weather). Our plans are to use it sporadically as needed, like when we find good sales on meat. And as a side benefit, or what I have been calling a Christmas Miracle, we currently have ice cream at our house! Back to The Day. I must admit I had a lot of trepidation as to how this newest adventure in homesteading would go. None of us had ever done it before. Carol admitted up front that she did not think she would be much help, and while Alan was game to try, we had already had discussions that once we started hunting game I would probably be the one cleaning it. Our skill sets actually compliment each other in our various chores around the property and this was one area we both agreed was more in my ballpark than Alan's. Albeit, if it was worse than I thought it was going to be, he would owe me big time! We woke on The Day and donned what we have since been referring to as our 'chicken clothes'. We packed up the items we thought might be needed to make this a more successful venture and drove to Ron & Carol's. As we got out of the truck, Alan said 'Hello, Chickens' and I asked if we shouldn't be saying 'Good-bye' to them instead. That was just the start of the some-what macabre humor we injected throughout the day. Alan and Ron got the messiest jobs that day. 1. 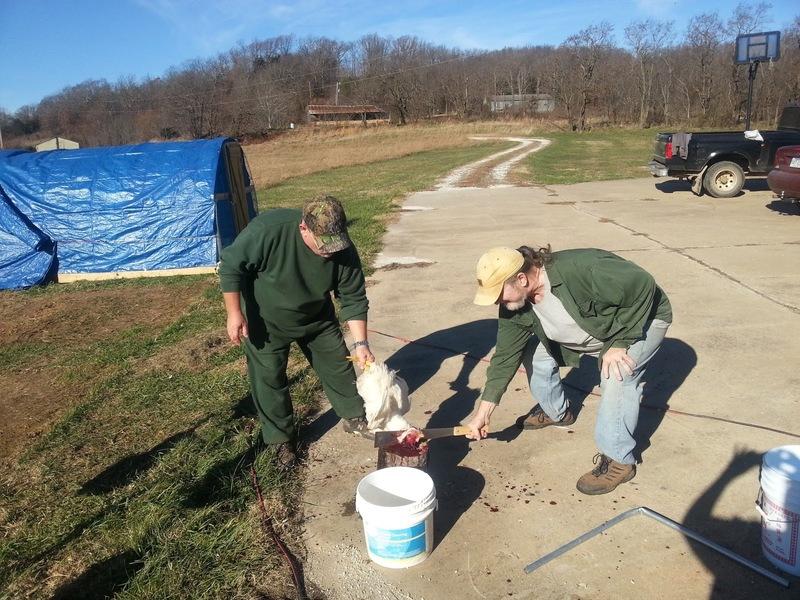 Ron would catch a chicken and hold it on the stump while Alan cut the head off with the corn knife we had brought. Note there was experimentation as to if it was better for Ron to first kill the chicken by stretching the neck and then remove the head.I think the jury is still out on the best way and some new methods may be tried next time. I was very proud of Alan taking on the job of head dispatcher (actually the dispatcher of heads not the chief dispatcher of the group). He did a great job even after an incident that included him being hit in the face by the headless, bloody neck of one of the subjects. Adding chickens to the 'hanging tree' to drain. 2. The headless chickens, most still flapping, were then hung by the feet to drain. We had to think outside the box a bit as there was nowhere set up to hang the birds. Carol had a wrought iron 'tree' for holding four hanging plants leaning against the garage. I suggested we open it up and hang the birds on each of the loops that normally hold hanging baskets. Using this, we were able to kill and hang four birds at a time. As steps 1& 2 could be a bit traumatic (for us - not the birds), I think we may try the killing cone method in the future which keeps the birds calm and is less messy. You can see the scalding pot in the fore-ground. 3. 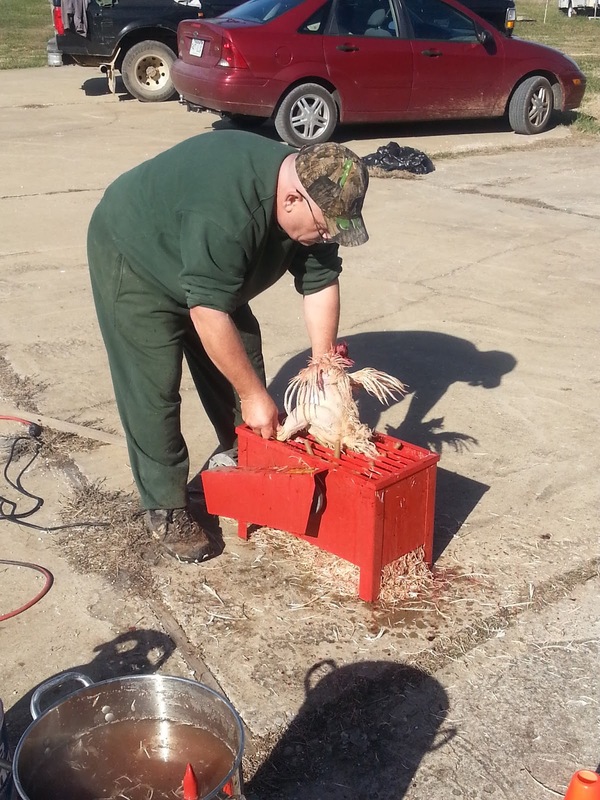 Ron has an automatic plucker, so the next step was for him to dunk the chickens in scalding water and then run them over the plucker. This also took some experimentation as hotter water made the plucker more effective, but too hot and the skin would start to cook and would tear when the feathers were being plucked. 4. Even at optimal temperature the plucker did not remove all the feathers, I would estimate that it removed 75-80% and those that remained were mostly on the legs and wings. So, the next step was plucking the remaining feathers by hand. I would start this tedious process while Ron was running each batch of 4 chickens over the plucker. Then he would join me to finish up the hand plucking. 5. The step I was dreading - eviscerating (gutting). I had prepared as best I could by reading up on the technique in several of our homesteading books and googling it as well. After a bit of muddling through on the first one, I found it was not complicated at all. You just have to take special care in several areas to not nick any internal organs (i.e., intestines) to keep the bird clean (i.e., no escaping poop). To aid in this goal we did stop feeding the birds 24 hours before The Day. Yep, check this off my bucket list. All in all, I did not think the process was as bad as I expected, I think the most disconcerting part was sticking your hand up into the bird and realizing it was still very warm. Logically I knew they would be warm, but mentally it was a bit disconcerting. - bend the legs at the joint at the top of the feet, where rough yellow skin meets feather. Using a sharp knife, cut between the joint to remove the feet. - use garden pruners to cut of the wing tips at the first joint in the wings, my gardens pruners were a great addition for The Day but, being garden shears, they did complain that they were vegetarians. - using a sharp knife, carefully cut a slit through the skin below the breastbone and running horizontally from inside thigh to inside thigh and stretch the opening with your hands. 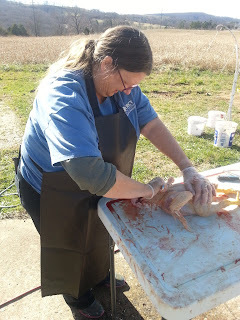 - at this point, after some experimentation, I decide I liked to turn the bird over and cut around the vent (tail) being careful to not cut the lower intestine that is connected to the vent. - I then used my pruners to carefully snip the back bone where I made the cut around the vent, this way, when it came time to removed the innards the vent was already attached to them and not attached to the bird. - turn the bird back over so the cut/opening under the breast bone is facing you and stick your hand into the opening and work your hand around the cavity walls to break the innards free. There really is not much connectivity, it just feels a bit weird and warm. - wrap you hand around the innards and pull them out through the opening, at first I was afraid of breaking open the intestines or some other entrail that may cause a lot of grossness but they are actually quite tough and will not tear when using your hands. You will actually need to pull with a fair amount of force to dislodge the wind pipe. - as the entrails leave the body, verify the vent you cut away is also fully detached from the bird, if not, carefully trim around it some more. - before the entrails fall into the discard bucket you may choose to pull the heart, gizzard and liver to save for giblets. Note, if saving the liver very carefully remove the gall bladder from the lower side of the liver. The gall bladder is greenish in color and if broken will taint the taste of anything it's come in contact with. - now rotate to chicken to work on the neck. - remove the skin on the neck by cutting the skin down along the neck and around the lower edge next to the chicken body. - remove the crop which is a small sack on the chicken body next to the neck. - you may see some wind pipe remaining at this end of the bird, it look a bit like a segmented worm and can be removed by pulling it out of the neck opening. - use the garden pruners to cut the neck off as close to the body as you can, save the neck for making bone broth. 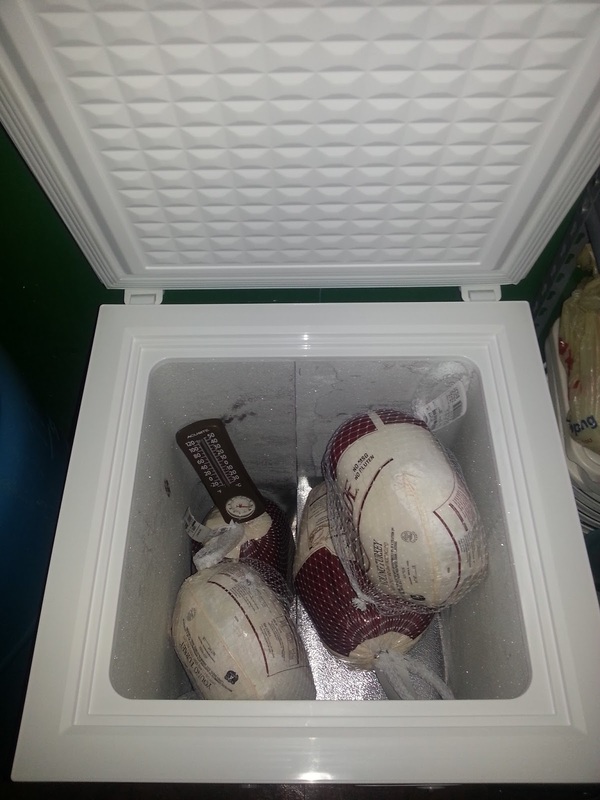 - rinse the bird and place in a cooler filled with ice water. 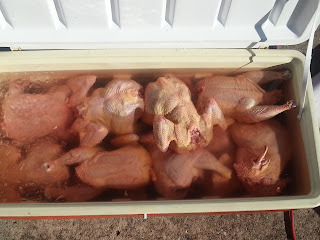 After the birds had rested a bit we transferred them to a second cooler as the water in the first cooler was being discolored by slight amounts of blood and also had a few floating feathers that had stuck to the birds. See, it really wasn't that bad, in our case we repeated the process 24 times that first day. After dispatching and cleaning 24 of the 37 birds we decided to call it a day. We were going to finish off the remaining chickens the following week, but later decided to let the remaining 13 birds grow for a few more weeks. 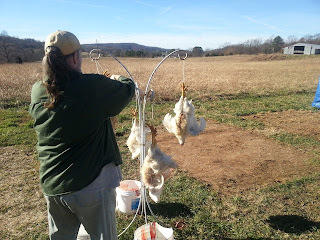 If you wait too long it is supposed to be harder to pluck and process the chickens, but again we decided it was time for some experimentation to see if we could produce some bigger birds, our first batch average between 4.5 to 5 pounds when dressed out. Wait, you may have noticed I did not mention Carol's duties for the day. She was our 'gopher' and she quickly volunteered to go for ice - twice. Fresh broth on the left - canned broth on the right. Canning the broth gives it a rich golden color. When not planning to can the broth, I only use 1 chicken. The broth keeps in the fridge for about a week and this makes enough broth for Alan and I to each have a cup at night and use it up before any of it spoils. When making broth to can I start with either one turkey or three chickens. Celery, carrots, onion, garlic and crystallized ginger. As you can seen, most ingredients are an approximation. I like celery and tend to add a little extra, you can adjust the amount to taste.The important ingredient to not leave out is the apple cider vinegar, it helps draw the nutrients out of the bones. making the next batch of bone broth on the right. Peel carrots, onion and garlic. Cut carrots and celery into 2 to 3 inch segments. Thicker carrot segments can also be halved length wise. Remove bird, allow to cool enough to pull the meat from the bones, you will notice the bones are very brittle. Remove vegetables from the broth, mine all go to feed my worm farm except the onions which worms don't like. If canning, pressure can at 10 pounds pressure (adjust for altitude) 90 minutes for quarts, 75 minutes for pints.